Western Rodeo Party ideas. 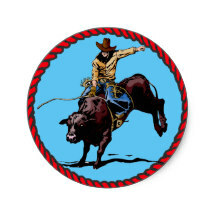 Rodeo games and activities for party. 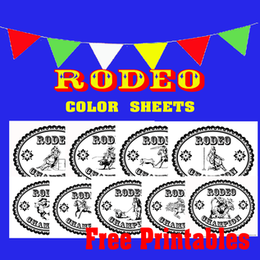 Rodeo party decorations and supplies.. Use for parties, corporate events, western themed booths. 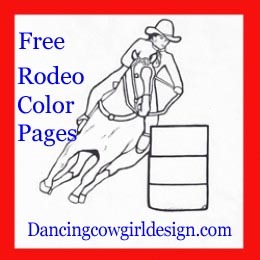 I have put together a page of fun party ideas with a rodeo theme. There are lots of ways that you can put these ideas to good use. The first thing I think of is birthday parties, but these ideas can be used for corporate events with a western theme, dances, or even decorations for a booth. Use lot of color, especially red, yellow and blue. 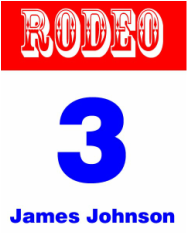 These are common colors that you see at rodeos on fences, flags and sponsor signs. Inside the arena you will also see colorful western shirts and of course, the rodeo clown. These type of flags go great with a rodeo theme. Hang them high from corner to corner in a room or as a border on the wall. Use them to square off a buffet area or booth. If you're having an event outside and have access to fences, be sure to hang some there. This is an all weather pennant banner. It is 120 feet long and the individual flags are 17 inches. I have some free printables with a red bandana border. There is a complete set of letters numbers and some western symbols that you can string together to make your own banner. 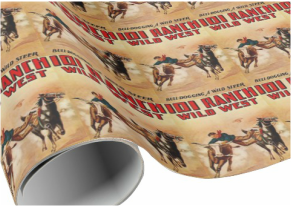 There is a link at the bottom for these and other free western theme printables. Hang some signs or banners to decorate the walls or mark your entrance. My favorite is a Welcome Rodeo Fans Banner. This is one I made up to show you as an example. If you're really lucky you might find a beer or soft drink rep at the grocery store who might have one to give or loan. They use them in displays all the time. 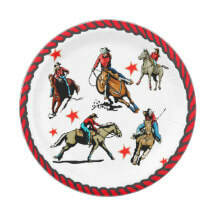 Lets set the scene for your rodeo party and leave your guest with some lasting memories. A cardboard photo stand up will serve as decoration and a great place for your guest to take fun photos. ​This easy to assemble cowboy boot with twinkle lights stands 58 inches tall and is 69 inches wide. 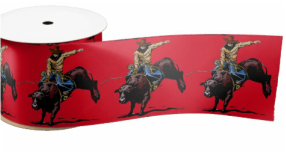 I think that a bandana print table setting would look good for a rodeo party. Otherwise plain white is good or use solid red or blue. This red bandana print set includes cake plates, cups, napkins, forks, spoons and knives. It also comes with a table cover and 2 sets of streamers. This is a nice set that has several coordinating pieces. I really like the centerpiece that looks similar to a rodeo arena and has the bucking horses and cowboys. 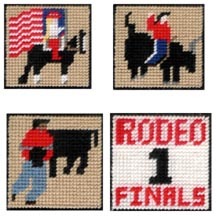 Some of the other pieces include a string of garland with bronc riders and bandanas on it as well as party favor bags and cups. 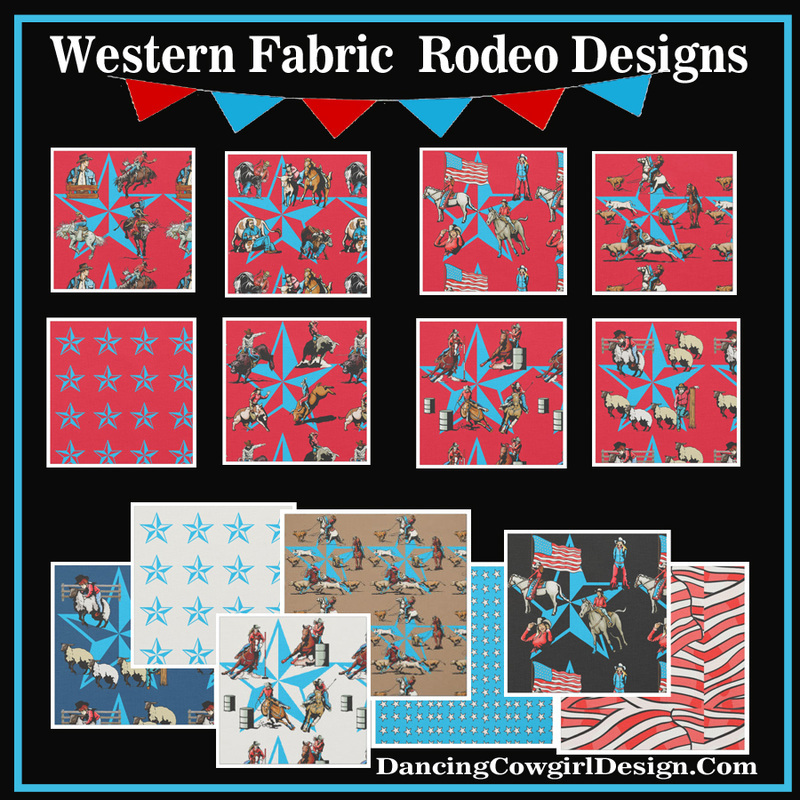 If you have some spare time and like to craft, you might enjoy making some rodeo coasters or blue jean pockets to hold a napkin and silverware to use on the party table. 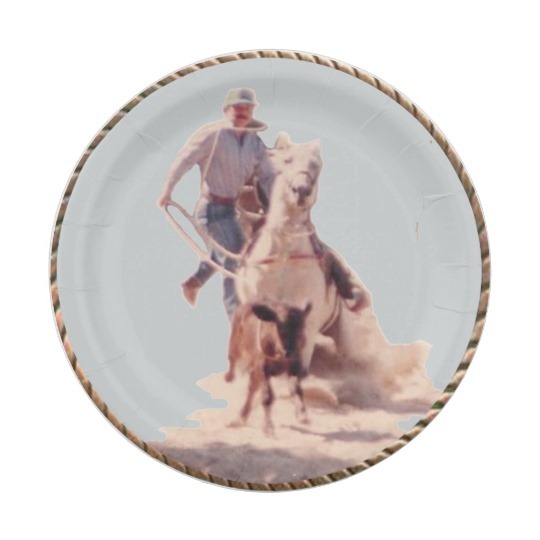 I started out to design a plastic canvas needlework coaster from one of my barrel racing photos and the project grew to a rodeo arena centerpiece for the table. You can get the free printable patterns and see the while project here. 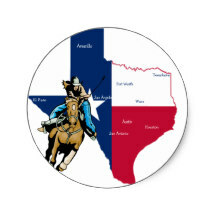 Since there are not a lot of party supplies that have rodeo event prints I designed some. Below are some examples of party supplies that can be customized with a name or other text. Most all of the designs I have are also available on gift wrapping paper and other items. 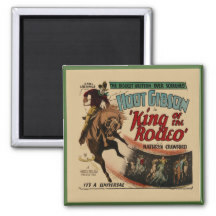 ​These and others including ones for the holidays are available in the Rodeo Days Store. 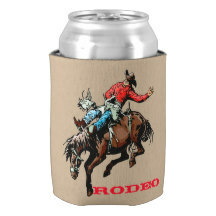 Items like stickers, magnets, key chains and cold drink koozies are great for party favors. 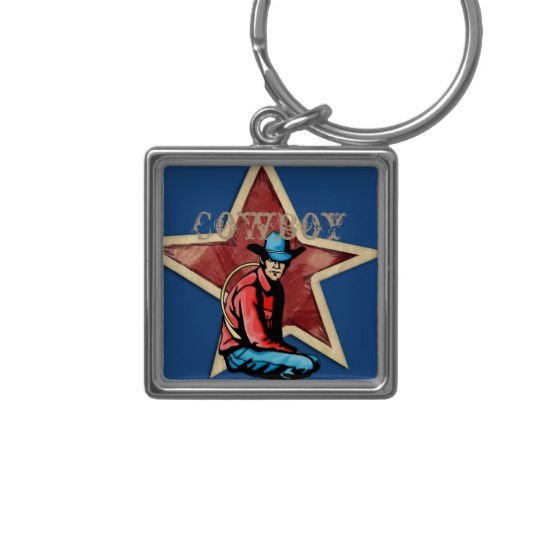 Available in the Rodeo Days Store. Mingle in a few big horse balloons at the entrance or tied to the chair for your guest of honor. 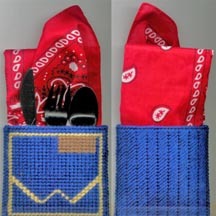 The bandana and blue jean print balloons will go well with a rodeo theme also. I designed a special Rodeo Party Invitation to go along with this party theme. 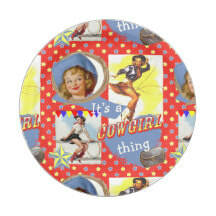 It is available in my Rodeo Days Store at Zazzle. There you can edit the text to suit any event or party. There is no minimum order. with the easy to use editor. 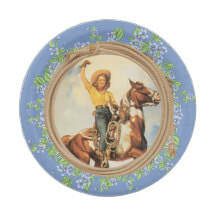 Here is another addition to my western party invitations that would work for a Rodeo Party. It has a editable script on the back. Here are some ideas for using back numbers at your party or event. Create a personalized version of a back number and use them as a party favor for your guest. Supply safety pins so they can pin them to the back of their shirt. The birthday person or guest of honor gets to be #1 of course. 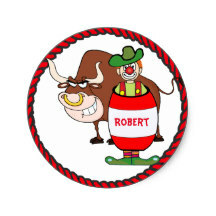 For a large event where you might ordinarily use a Hello My Name Is tag, replace that with a rodeo back number and add a name. And Yes, have them wear it on their back, that will be much more fun. Make a smaller size for table cards to number your guest tables if you're doing that. Include a little background music to help add to the atmosphere. Tune the radio onto a country channel or gather some good music that you can play from other music devices you may have. A rodeo clown clown is in the arena to help the cowboy get safely away from the bull he is riding, but he also entertains. So instead of the circus type clown at a party, how about a rodeo clown. He or she could blow up balloons, interact with the guest in a fun way and pose for photos. Pinatas are always a fun activity for kids at a party. 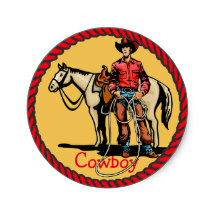 There are western themed pinatas like horses and cowboy boots that will work great in a rodeo theme. This is a kit that includes the horse pinata, a blindfold and 3 pounds of candy. There is also a pull ribbon pinata conversion kit if you would rather have it with the strings instead of hitting at it. The cowboy boot pinata measures 17.5 x 12 inches. It will hold up to 2 pounds of candy and party treats. I have made my own game of Rodeo Bingo. It is free and printable and has enough different playing cards for 20 people. This is a sample of the cards and word list. You will need to download the full size version that will print to the size of a sheet of paper. Have a fun time with a game of bingo and use small party favors for prizes. Roping Dummy Activity Or Roping Dummy Competition. Kids and adults will have fun trying their hand at roping. 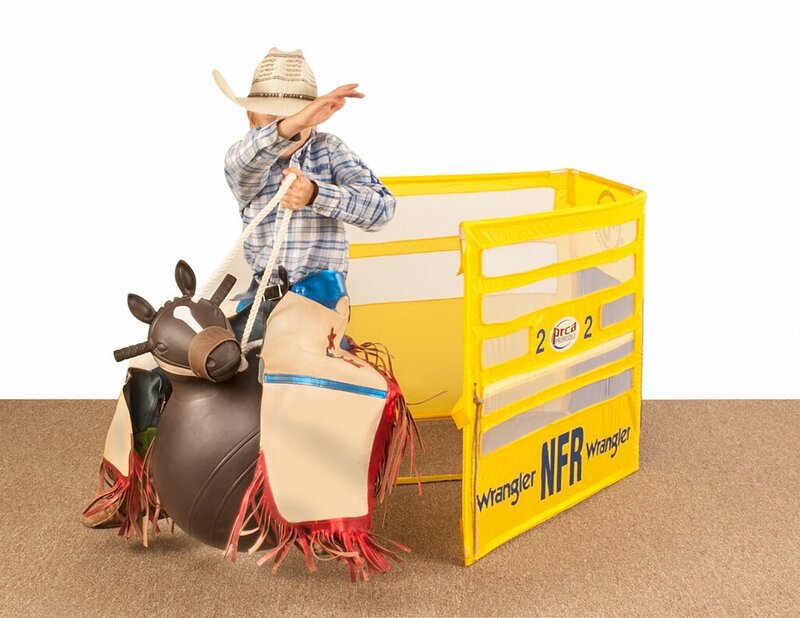 Set up a roping dummy as an activity for your guest or make it a little contest. I have a page all about roping dummies that also includes some roping instruction for beginners. No rope, no problem... I have seen hula hoops used in place of ropes. They are easy for smaller kids to throw of the calf or steer head dummy. Have at look at this cute video of dummy roping where they used hula hoops, and in this case, a large stuffed animal for the dummy. Invite your guest to bring along their own stick horse, homemade is fine, or supply a few for the party to have a stick horse rodeo. 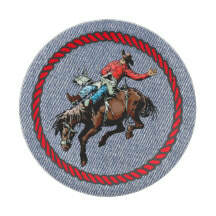 Set up barrel racing patterns and other events for a fun and funny day of rodeo games. See my guide to having a stick horse party with rodeo events. How do I know that this is so much fun? I had my own rodeo birthday party. As a gift, my brothers family gave me this trophy to remember the day. We had 3 different patterns of barrel racing, pole bending, dummy roping and a goat to pull the ribbon from its tail. 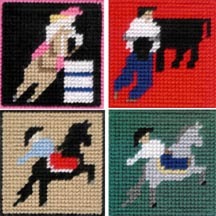 I have a page that is just about having a stick horse rodeo that has event patterns to use and ideas for things you can use if you don't have access to barrels, poles etc. And you have to see the video of my mom running barrels on her homemade stick horse. The party events included adult age groups also. I have one word...Hamburgers! To me, a hamburger is rodeo food. If I'm headed to a rodeo, I will most likely pass on dinner and wait till I get there and have a Rodeo Burger. Just something about 'em. 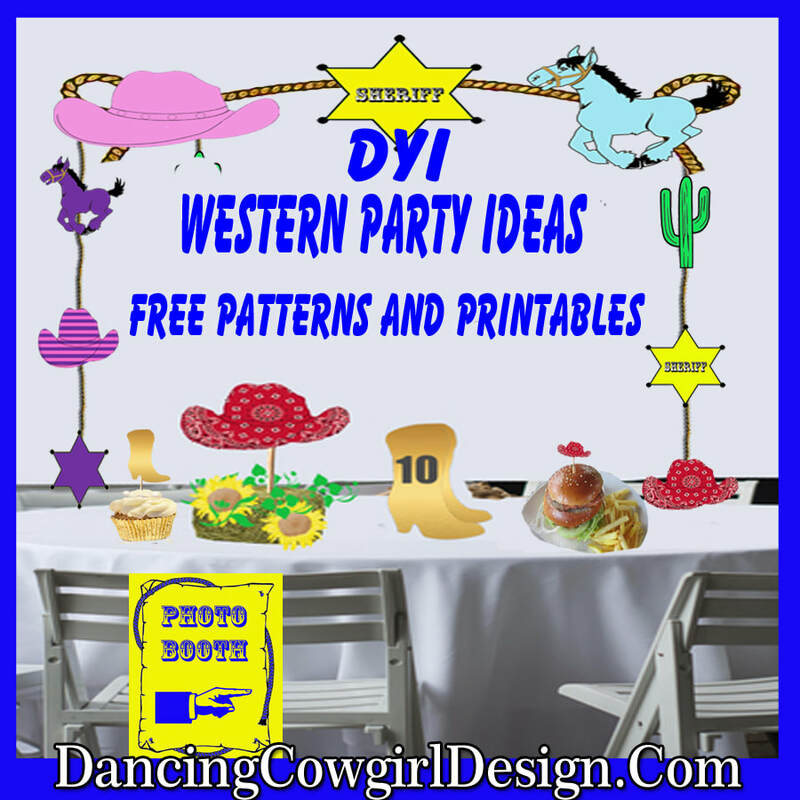 Dress up the party food with western theme food picks that you can make with my free templates. It seems like cupcakes are the popular thing these days. They are easy to make and work well for parties. You can add a western topper to dress them up. 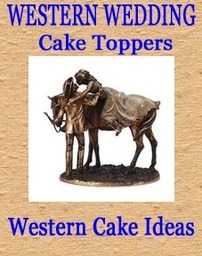 As for cakes, WOW, there are so many creative ideas for western and rodeo style cake. The only thing is that I don't have rights to the photos in order to publish them here. 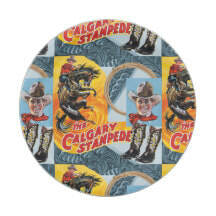 So I have included this link to google search for images of rodeo cakes. 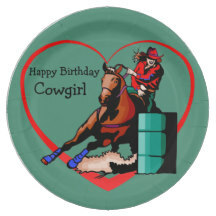 You can also check out my Pintrest board where I have a pretty good collection of rodeo cakes. 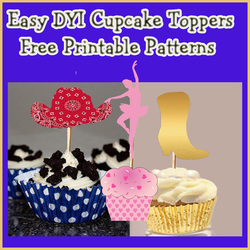 If you like to do it yourself, stop by and get the instructions and free printable patters for western cupcake toppers. 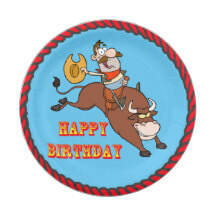 Use Rodeo Toys To Decorate A Cake. 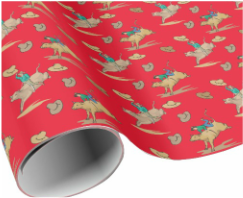 The Rodeo Days Store also has gift wrapping paper and ribbon that coordinate with the party supplies. 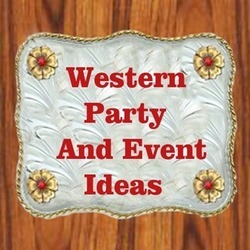 Visit the main page for more western party ideas.